12-year-old Koichi (Koki Maeda) and his younger brother Ryunosuke (Oshiro Maeda, Koki’s real life brother) have been split up against their will. Koichi lives with his mother and grandparents in Kagoshima, in the shadow of a constantly rumbling volcano. Ryunosuke lives a comparatively spirited life with his rockmusician father in Fukuoka. But when Koichi discovers that a new bullet train line is due to open connecting the two towns, he determines that the intense energy generated by two trains passing in opposite directions will work a miracle, and their wish to be reunited will come true. One of Japan’s finest living directors, Hirokazu Kore-eda (After Life; Still Walking) is known for his interest in hidden feelings and unvoiced wishes, and in particular for his ability to depict children and family with honesty and insight. I Wish is a superbly acted picture of family life and a heart breaking adventure story that is tender, but never sentimental. You wan't have to look far to find enthusiastic praise for the film, summed up by David Jenkins at Little White Lies as "Nothing short of glorious." 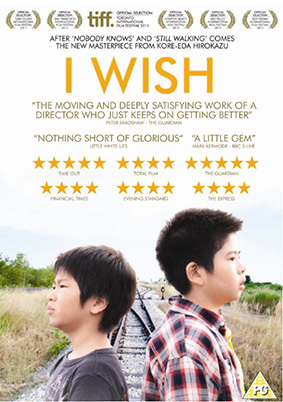 I Wish (Kiseki) will be released on UK Blu-ray and DVD on 27th May 2013 by Arrow Films at the RRP of £19.99 for ther Blu-ray and £17.99 for the DVD.